As I left the office Friday morning, the sun was just burning through the thick Seattle fog. Portland is about 2 and 1/2 hours south, and I was looking forward to the ride. A Street Triple may not be everyone's first choice for a long-distance bike, but I've never had a problem spending a few hours on mine. After arriving in Portland, I dropped my backpack at the hotel, grabbed a bite to eat then headed over to The One Show. The show started at 6 PM -- when I arrived at 6:30, motorcycles were already lining the street for a few blocks in every direction. After circling the block a few times, I lucked out and snagged a spot right out front. The first thing I noticed was the diversity of bikes parked outside -- cruisers, sport bikes, naked bikes, adventure bikes, scooters and even a few bicycles. It didn't matter what you rode, everyone was here for a good show. 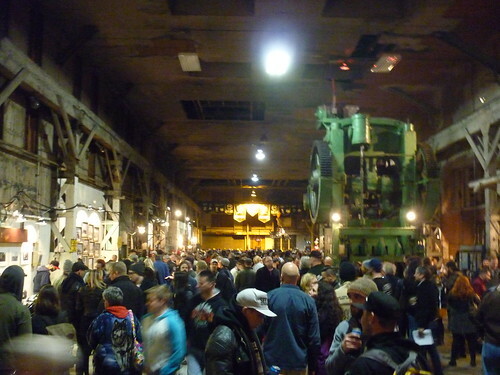 I had heard the show changed venues this year due to outgrowing the last location, and it was easy to see why. 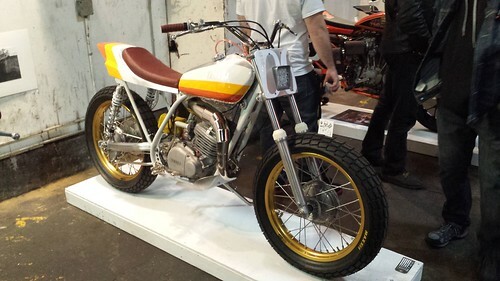 I had the opportunity to attend The One Show in 2013, and it was mostly choppers and bobbers. 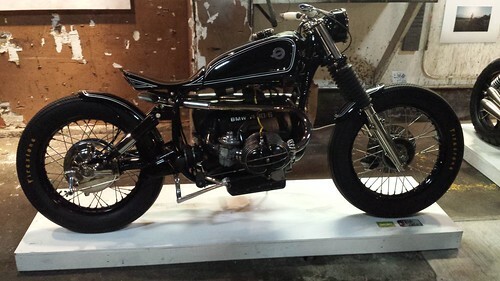 While I love these kinds of bikes (there's a hard tailed CB750 in pieces in my garage currently), they aren't everyone's cup of tea. This year had a different vibe -- while the chopper contingent was still well represented there were plenty of other genres as well. 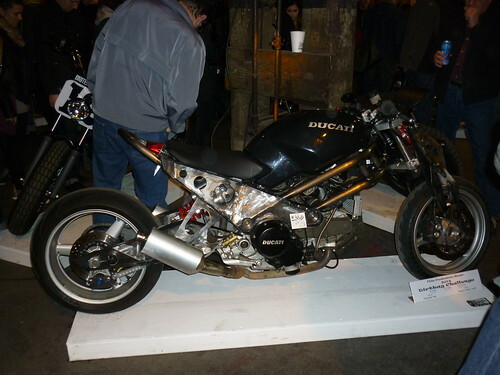 There was an entire room full of ADV bikes -- including a rugged Ducati Multistrada outfitted by MotoCorsa of Portland. 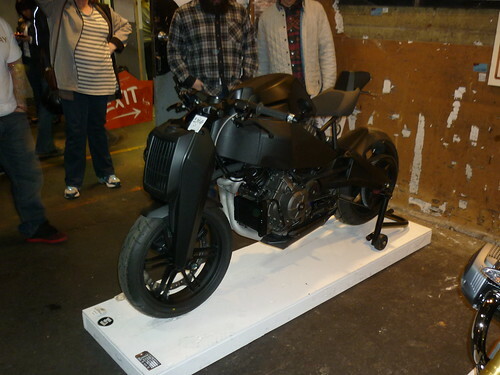 Other bikes included custom street trackers, a chopped Ducati Monster and a rare Buell-based Ronin motorcycle. The parking lot outside held a few vendor booths, along with mini-bike board track racing. This was arguably the most entertaining part of the entire event. 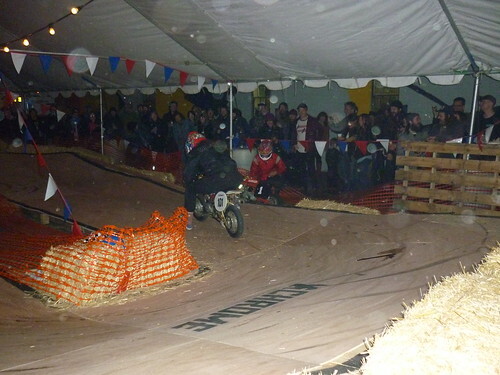 The first few rounds I watched ended in one or both of the bikes flying off the track and into the hay bales strewn about -- complete with orange safety fence wrapped around the sprocket. Racers never reached speeds to make each crash anything more than entertaining. 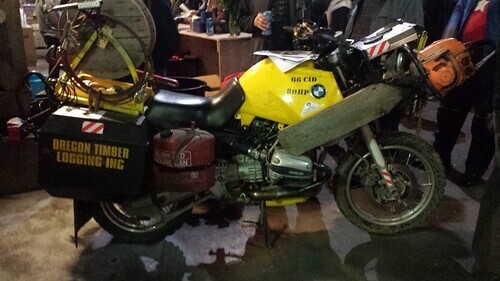 After a few rounds of continued abuse, one of the bikes became very stubborn and wouldn't idle. This forced each rider to start the race with the throttle pinned to prevent the bike from dying, resulting in a few hilariously unplanned wheelies. After watching the mini bike racing, picking up a souvenir t-shirt and doing one last round to make sure I didn't miss anything, I made my way back outside to head out. To my surprise, the line to get in to the show now stretched almost completely around the block. What started as a small show in an abandoned warehouse 6 years ago now had people waiting upwards of an hour just to get in the door. 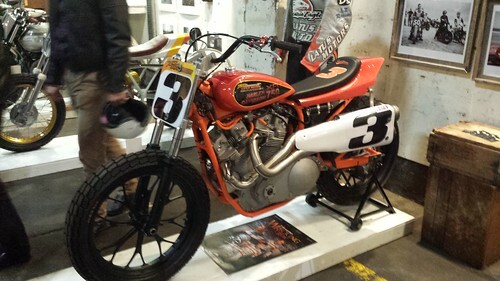 A diverse crowd, plenty of entertainment and beautifully crafted motorcycles made for one of the best motorcycle shows I've attended. I will definitely be back next year. 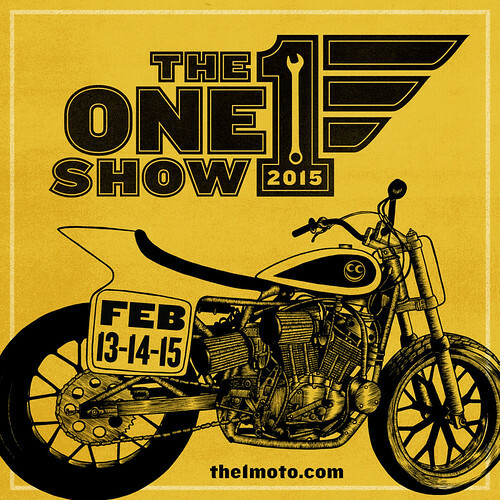 If you are at all able to make it to Portland around February, I highly recommend checking out The One Show.